With the 1962 World’s Fair, Seattle asserted itself as the city that invented the future. Seattle Center, home to the Space Needle, Key Arena, the Pacific Science Center and other Jetsonesque architectural wonders, gave us a stunning Mid-Century Modern vision of our presumed technotopian future. In 2000 the EMP Museum opened, inserting a postmodern generational overlay in the form of Frank Gehry’s gripping postmodern architectural style. Ever upward, ever forward. For #HopeTuesday today, I offer you a metaphor. Let’s rekindle our dream of a clean, sustainable, prosperous future with opportunity for all – a true and attainable American dream. 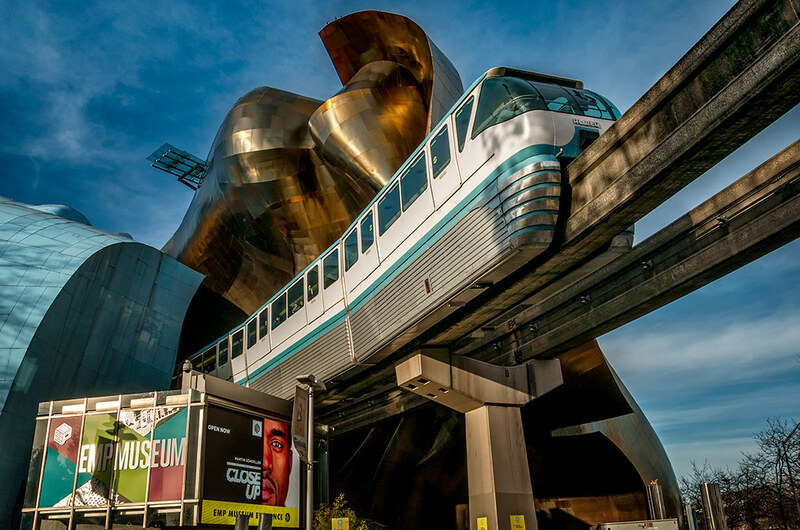 I took this shot of the World’s Fair monorail, which connects the EMP and Seattle Center with downtown, in November of 2013. What could possibly be more optimistic, more hopeful, for Americans than a train destined for a technological Utopia? Here is something that shows there is hope for an all inclusive future. Just believing as this man does is a fantastic start. Great one, Rho. I knew the guy was an immigrant but didn’t realize he was Sikh until this. That’s a group that has been treated as unfairly as anyone. It’s impossible not to respect his sense of community and civic duty.